Bonnie Rose George is one of the premier amateur women golfers in the Philadelphia region. Her winning consistency on the links has gained her scores of trophies and gold medals. She comes from a golfing family and played in her first tournament at age 12. Both of her brothers were outstanding amateur golfers. In addition to her winning ways on Philadelphia area courses, she was a member of the gold medal winning teams in the 1993 and 1997 Maccabiah Women’s Golf Games. The Women’s Champion at Philmont Country Club for 20 years, George played in the first position representing Philmont in the Philadelphia Cup and the Women’s Golf Association Team Matches. She played Team Matches for some 30 years. She was a perennial selection by the Women’s Golf Association for the Griscom Cup, a yearly tournament between the top seven players from Philadelphia, New York and Boston. 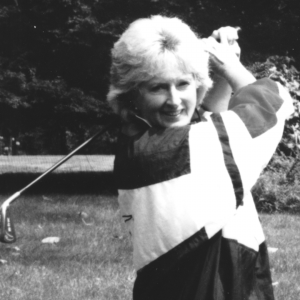 She won the Women’s Golf Association of Philadelphia’s Tournament of Champions twice, and twice won the Philadelphia Senior Amateur title in 1994 and 1997. She has competed in the U.S. Women’s Amateur, U.S. Women’s Mid Amateur and the U.S. Women’s Senior Amateur, reaching the quarterfinals in 1998. She won the Boyle Cup in 1995, 1996 and 1999. In 1985, George was one of only two amateur golfers to be selected to play in the Ladies Professional Golfers Atlantic City Classic. The list of Bonnie Rose George’s awards and honors won at Philadelphia area golf tournaments is as long as a three wood. She has been an inspiration to women golfers throughout the Philadelphia area.